On a perfectly calm day, the ocean becomes like glass reflecting the world around it. It’s as if an identically opposite secret world hides below the ocean surface. Those are my favorite days at sea. On those days, the ocean absorbs heat from the sun, creating a thin layer of warm, buoyant water, perhaps just a few feet thick. It floats atop the ocean like oil floating on vinegar in salad dressing, separating the air from the deeper ocean. Scientists have assumed that under calm conditions, this surface layer stays relatively stable and doesn’t mix with deeper waters. But new observations suggest that this may not be true. In this layer of warm water just below this apparently calm surface, a great deal is happening. The layer is swirling and churning, transferring energy to the deeper waters. The ocean is a major player in the planetary system that drives Earth’s climate and weather, and the ocean surface is the critical junction for energy exchange between the air above and the sea below. 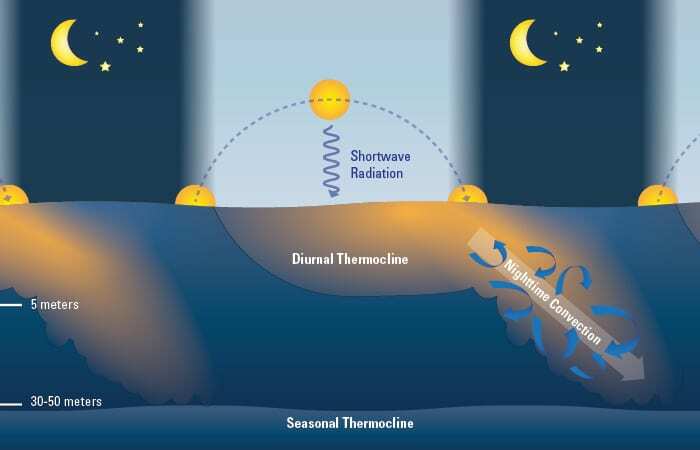 Small differences in the upper ocean will change the amount of heat and momentum being exchanged from the ocean to the atmosphere, and into the deeper ocean. My research has focused on this nebulous mixing piece of the puzzle. As a graduate student in the MIT-WHOI Joint Program, I am exploring how the heating of the upper ocean over the course of a day causes relatively small changes that can change the interaction of air and sea over vast areas and longer periods. In the past it has been hard to make observations in the upper few feet of the ocean using traditional oceanographic instrumentation. Now, using unmanned underwater vehicles and instruments, my research group can measure the smallest-scale chaotic mixing of the water. If we can better understand how daily warming affects air-sea energy transfer, we can provide a deeper and more accurate understanding of all the climate-related and other processes powered by it. In some ways, the ocean is like your morning cup of coffee. Pour milk into it and it begins to swirl, creating turbulence in your cup. Stir your coffee with a spoon, and it creates even greater turbulence. The more mixing that occurs in your coffee, the greater the turbulence. A stream of milk into your morning coffee is easier to visualize than the transfer of heat and momentum into the ocean, and far less complicated. Turbulent fluxes in the ocean depend on factors such as the amount of moisture in the atmosphere, shortwave radiation from the sun, longwave radiation emanating from the Earth, wind speeds above the ocean, and the temperature difference between air and water. All these factors influence one another, so ignoring one can spoil our estimates of turbulent fluxes in the ocean. In a study published 2013 in the Journal of Climate,WHOI oceanographer Carol Anne Clayson and I described just how much error might occur in calculations of turbulent fluxes if one factor is not taken into account: the daily warming of the ocean surface by sun. 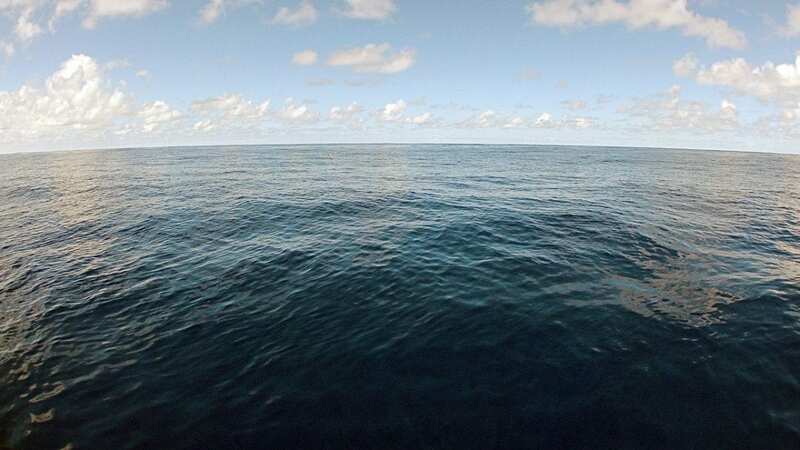 The ocean’s surface spans horizontal distances of thousands of miles—larger than the size of continents. Over the whole ocean, a small miscalculation can matter a great deal. It could skew calculations of the amount of energy exchange between the ocean and the atmosphere by as much as several percent, which is enough to affect many important processes in the atmosphere and ocean. Complicating the picture is that this daily heating process occurs differently in various parts of the globe. In some places, the ocean does not warm at all, while other places may have those perfectly calm days where the surface heats up many degrees. 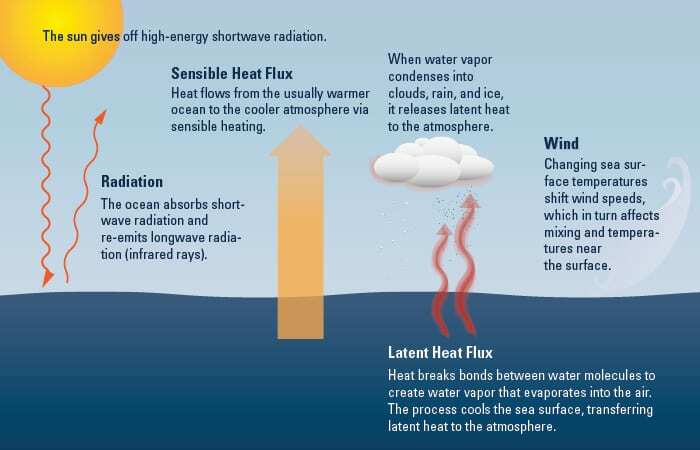 These differences in where the ocean gets heated affects ocean currents and weather. Heating at the ocean surface enhances evaporation that can help create a thunderstorm, and it also affects the strength of global climate oscillations, such as the El Niño-Southern Oscillation (ENSO). Every day the sun rises and warms the ocean over a depth of tens of feet, with greatest warming closest to the surface. All this happens in just a few hours at the hottest part of the day. So instead of your homogenous cup of coffee, imagine the coffee is stratified in layers, with the hottest at the top of the cup and the coldest at the bottom. On calm days with little wind, the ocean is like your coffee cup without a spoon. There’s nothing to stir it up and mix it to make the coffee temperature consistent throughout the cup. And so scientists have believed that the warmer ocean surface layer stays stable and doesn’t mix with deeper layers. The heart of my research is new previously inaccessible data that allows me to examine the fluxes of heat and momentum into and out of the uppermost part of the ocean and the factors that affect mixing between surface and deeper layers of the ocean. These turbulent fluxes of the ocean occur at the smallest scales of motion, on the order of centimeters, during different conditions, including those very calm days when the ocean is like a mirror. 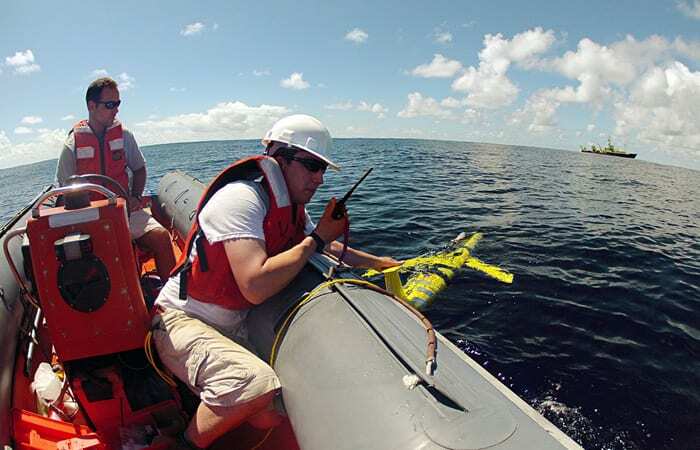 During two recent field experiments funded by the National Aeronautics and Space Administration and the National Science Foundation, a group of scientists led by WHOI physical oceanographer Lou St. Laurent deployed autonomous gliders and profilers from a research vessel to measure the smallest scales of motion in the ocean. Profilers are more traditional instruments, which can take more than 500 measurements of turbulence per second, but they must be deployed from a ship for each profile. This makes each profile very time-consuming and measuring the upper few feet of the ocean impossible. However, the newer gliders go up and down in the upper ocean, rising all the way to the surface. 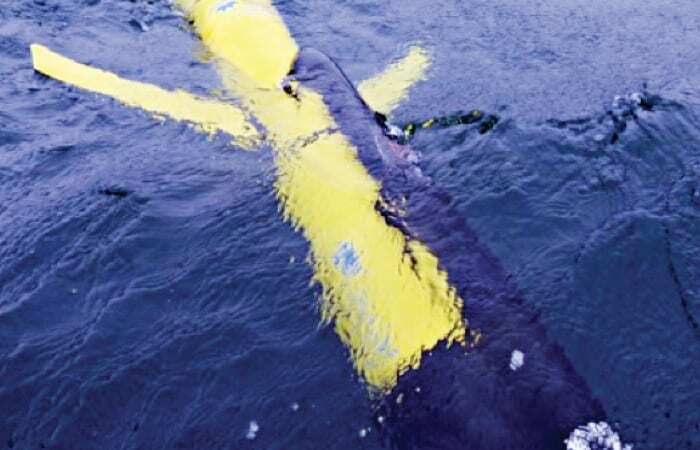 Once deployed, the gliders can measure the ocean for up to a week at a time without pause. The gliders collected profiles of the upper ocean more than 4,000 times during two 14-day field campaigns, with special instruments attached to the gliders that measure turbulence with the same precision as profilers. By taking thousands of observations over just a few feet in the ocean, we can start to make generalizations about the smallest scales of motion. Our new observations show that this concept of a smooth sea surface with little mixing on those calm days is deceptively simple. I am exploring what could cause mixing during the day. Our current understanding of the upper ocean under those calm conditions cannot tell the whole story. So far, observations point to the importance of surface waves (like those that crash on the beach) and waves that exist inside the ocean, called internal waves. To use the oil floating on vinegar analogy again, internal waves are the undulations at the interface between the two components of your salad dressing. My research as a graduate student has just started to scratch the surface of these layers. By the time the sun sets, this thin surface layer of warm water disappears, because, in general, the atmosphere is cooler than the ocean. Without the sun to heat the ocean, water near the surface begins cooling. The cooler water is heavier, and it sinks and mixes deeper into the ocean, creating a very well-mixed layer near the surface—a clean slate for the next day. As you sip your morning coffee, the daily process of upper ocean warming starts all over again. Think about the turbulent fluxes going on in your cup and in the hidden world just beneath the shimmering surface of the ocean. The research was funded by NASA, NSF, and the National Oceanic and Atmospheric Administration. Alec Bogdanoff was supported by the Department of Defense National Defense Science & Engineering Graduate Fellowship Program.